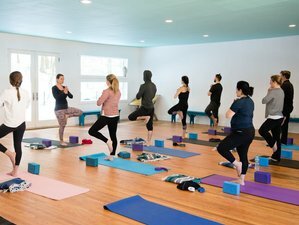 A four-day, three-night getaway at Streamside Yoga, a studio by the Tremperskill Stream in the beautiful Catskill village of Andes, New York, USA. Guest stay in the Streamside or Grapevine Airbnb apartments. We offer Morning and afternoon yoga classes and hiking in nearby trails. Breakfast and lunch provided. Welcome dinner on Thursday evening, Friday dinner on your own or in the village with Satsang at 07:30 p.m., Saturday dinner on your own. Throughout your stay we'll guide you in staying present in nature, your environment and yourself and connecting with your breath and the ever changing creative energy within you and the universe. Willow Drey Farm logging offers Streamside 1 and Streamside 2, with Streamside Yoga as a retreat center. Streamside has seven bedrooms with 10 individual beds and the yoga studio is great for yoga, spiritual retreat, and conferences. The Streamside yoga studio is a large 40 feet by 40 feet space with a large 30 feet by 18 feet deck overlooking the Tremperskill Stream. Streamside Yoga can arrange for a chef to shop and cook for your group for an additional fee. Tables and chairs can be set up in the studio or on the deck for workshops or meals. Grapevine 1 and Grapevine 2 add five more bedrooms (four queen and one double bed). The Village of Andes is a wonderful place to get away in all seasons, it’s quiet but still festive, friendly, and fun. Its landscape is unmatched for its beauty. It is a spiritual place where the rivers run in all directions of the compass. 11:30 - 13:00 Brunch / lunch available. Dinner on your own. Cook in the community kitchen or go out to one our our local restaurants. The beautiful historic village of Andes in the western Catskills is accessible by the Adirondack Trailways bus from Port Authority Bus Terminal in Manhattan. Vegetarian welcome dinner is on Thursday evening. Friday and Saturday dinner you are on your own, you can go out to eat at local restaurant or prepare your own dinner in the apartment you are staying in. During your free time, you may try some of the nearby restaurants in Andes: The Andes Hotel, Wayside Cider, Woodies DIner, or Two of Tarts. Brushland is a top-tier restaurant in nearby Bovina. Acupuncture massage can be arranged by appointment for 120 USD. You can reach the retreat center by car or by Adirondack Trailways Bus from New York City.